Calais is the gateway to really accessible French towns and these three suggestions are within easy reach. Calais is famous for hypermarkets and for being the place the ferry gets you to when you cross over to France. Whether you’re on a ‘booze cruise’ or you’re holidaying in the country, Calais is likely to be the first glimpse of France you get if you’re crossing the Channel to France. For those who are going for the cheap and seemingly infinite wine and cheese, a few hours in Calais is often enough. For those venturing onwards, a few minutes in Calais is all they need. But what if it was actually worth sticking around and exploring for a while? 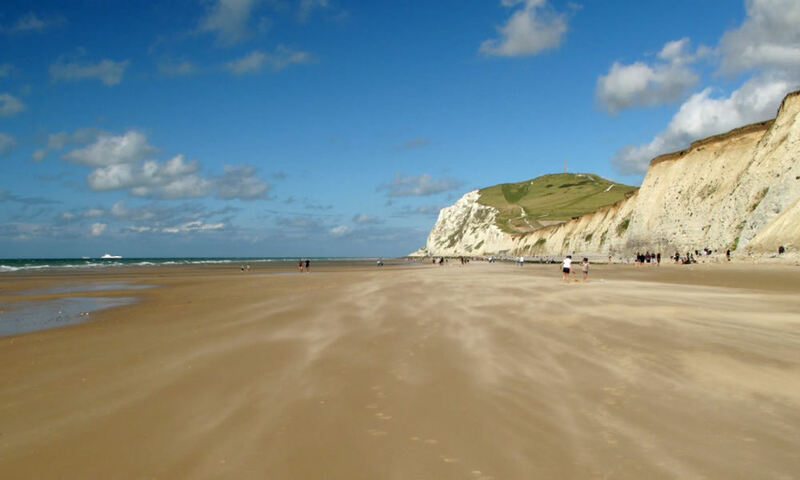 What could be found less than an hour away from Calais’ industrial hub? Audresselles is a tiny (really tiny, with less than 1000 residents) fishing village not too far along the coast from Calais at around 19 miles (about 31 kilometres) drive. It’s pretty and quaint, and a far cry from the factories and hypermarkets of the main port, so it’s a great place to visit when you’re nearby. Enjoy a stroll along the coastline, or perhaps a spot of relaxation time in one of the cafes. Sit outside on a sunny day and the atmosphere is simply wonderful. Audresselles is popular with artists who can often be seen painting the beautiful sea views. Even for those without an artistic bent, it’s easy to see why this little place is well worth checking out. The name Montreuil may well be familiar to those who love big budget movies, classic novels, or musical theatre (or all of the above), as it features in Les Miserables. Victor Hugo himself only ever spent a morning there, but the place fascinated him so much that he chose to use it as the setting for the beginning of his novel – and fans have flocked there ever since. In fact, the play is performed in the town once a year, as a tribute, and it is as popular as ever. Apart from Les Miserables, Montreuil has two museums that are worth visiting. These are the Roger Rodiere Museum which contains archaeological finds from the town, and also the Musee de l’espoir de Franck et Mary Wooster. Simply put, this is a stunning collection of 18th to 20th century furniture. The Abbey de Saint-Saulve is a fantastic place for those who are interested in architecture, and from the top of the building the views are magnificent. Montreuilis easy to get to from Calais and is around 44 miles (about 71 kilometres) drive. Although slightly farther away (46 miles (about 74 kilometres) away; around a 50 minute drive), Busnes is reached by a straight A road, and is easy to find. This town is not on the coast, so it makes a change to see rural, farmland, and if you enjoy walking then there is plenty of chance here. But Busnes is really best known for its food. There are two restaurants of particular note here. The first is the two Michelin starred Le Chateau Beaulieu. Owned and run by Marc Meurin, not only is this restaurant considered the best in the entire Calais region, but there is also a magnificent hotel attached, so if you are looking for a place to rest your head for the night (after enjoying a sumptuous meal), then this could well be it. It is pricey, though, so if your budget won’t stretch there is another restaurant to try. Le Jardin d’Alice served incredible food, and also offers cookery lessons. Busnes is definitely the place for foodies to visit when in Calais! Sail from Dover to Calais or sail from Dover to Dunkirk and drive southwards to Calais.